A giant walked with mighty legs into a town on England’s coast. He used his mighty arms to crush the men who challenged him. And with his mighty hand he stole the Duke of Hoel’s daughter, then turned his mighty back upon the broken, ruined town. 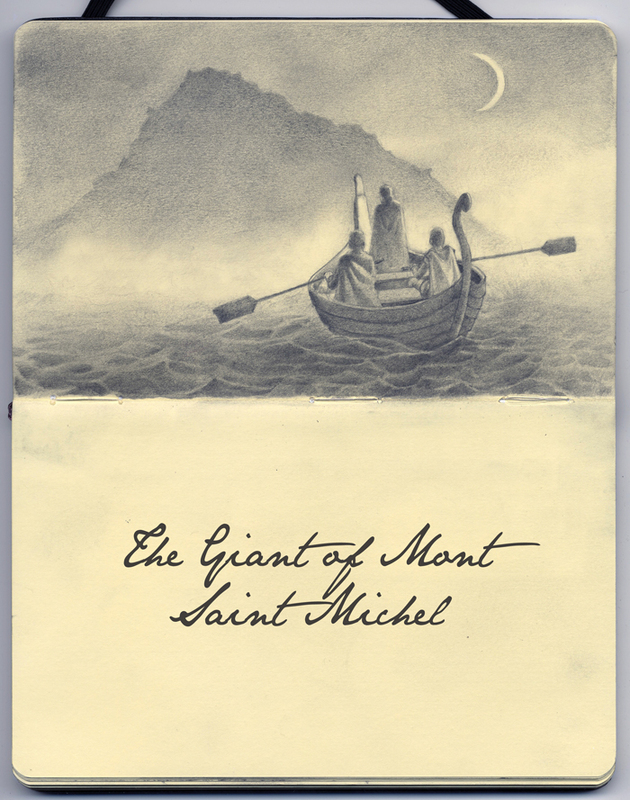 This giant who brought death and doom lived high on Mont Saint Michel. His cave sat in that island like a socket in a skull, and since that time we know this monster by that island’s name. Some noble knights set sail to fetch the damsel from her captor, but these poor knights sank quickly when the giant struck their boats with great enormous hunks of stone. Steel Armor is a poor protector from the ocean’s mighty grip, and on that day all goodness seemed to vanish from the earth. Poor, heavy-hearted Hoel asked the King to war on his behalf. The good King’s name was Arthur, and he dared to take the task. Later under fog of night, he sailed with two companions to the deadly island’s shore. Before them in the darkness burned two fires, east and west. They took a chance and headed west to see what fate would bring. A burning indignation swelled throughout King Arthur’s chest. He swore that he would kill the giant or be killed in turn. And with a renewed purpose, brave King Arthur marched eastward. He set his gaze upon that fire’s distant, sputtering light. It burned the yellow color of a demon’s hungry eyes. They smelled the giant long before they saw his massive form. He was the foul embodiment of might and appetite. King Arthur fell upon him, but the giant leapt away. The only damage to the monster was a leaking scratch above his eye. The giant’s hand snatched up a club of oak; its end was smeared with gore. It swung in arcs that blew the wind, and knocked King Arthur from his feet. It looked as if the giant’s strength would make short work of England’s King, but on the giant’s brow the once small cut began to grow, and from it poured the giant’s blood so that it dripped into his eyes, and he began to swat at shadows. 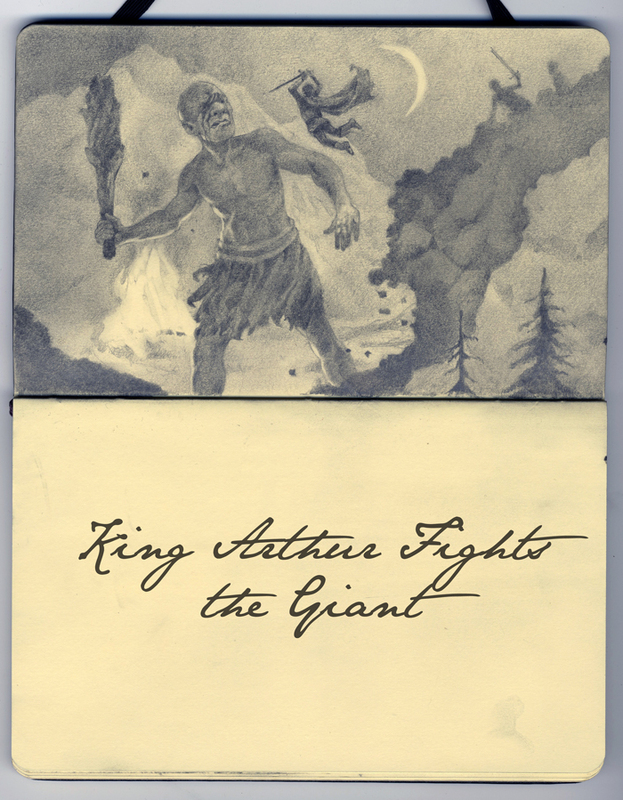 Stumbling over rocks and trees, the giant could not see a thing, and then good Arthur struck! 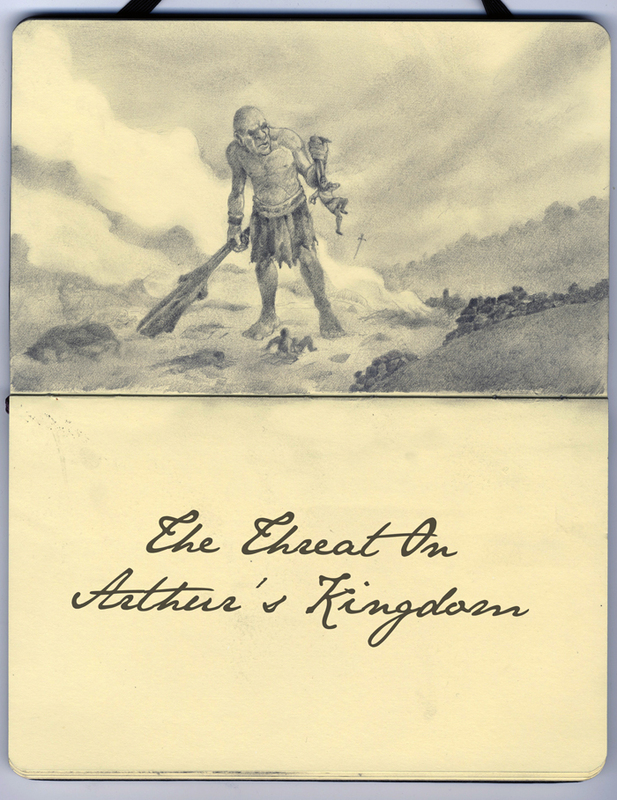 He thrust his sword precisely in the giant’s massive heart. At once the creature toppled like a splintering, ancient tree and shook the earth and woke some birds a mile off the shore. King Arthur and his friend Sir Kay cut off the giant’s head and took it back to England’s coast to let the people know, that though a giant might cause pain and war against what’s right, a giant’s ways don’t last forever. Good wins in the end. Thanks for this, Zach. I love its reminder that even the smallest act of courage—a scratch above the eye—is enough. For my part, I’m not brave enough to kill a giant. But a scratch? I think I can manage that. Good word, Josh. I like that. Thanks Josh. The thing that strikes me most about this story is that King Arthur doesn’t farm out the job to a giant fighting committee. 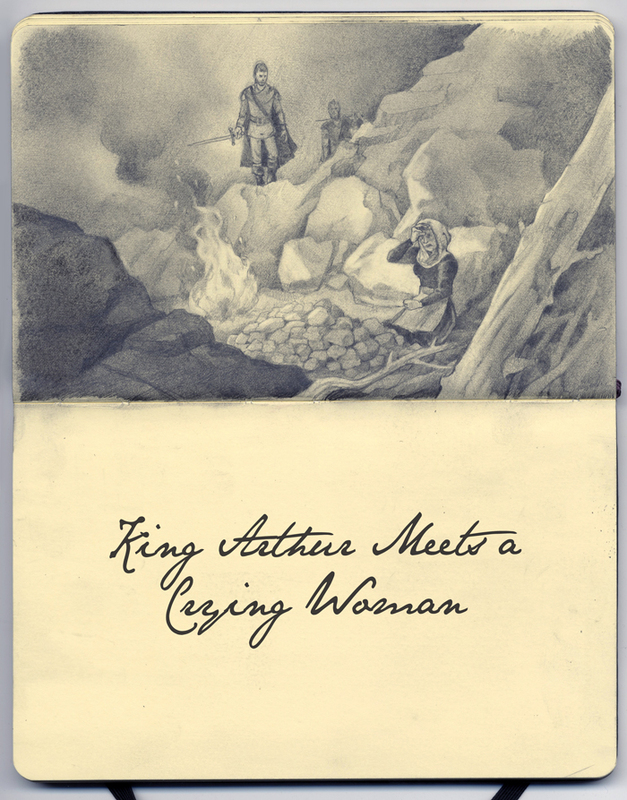 Most of the King Arthur stories feature King Arthur sending the Round table knights out on quests and things. I like that he’s a little hands-on in this one. He was so determined! Your illustrations are a wonderful addition to the story. Can’t wait to share with my 14 yo. I’ll enjoy watching his face roam around the page and pick up the small details that tell the larger story. Thanks for sharing! My son will love this. He’s nine and wants to be a knight. I’m excited to share it with him. Awesome! That’s a great thing to want to be!